This story combines work from three of our spring projects. As part of our fairy tale unit we decided to tell our own fractured version of the Frog Prince. This work coincided with our "Take it Apart" unit in which we dismantle old mechanical and electronic devices to answer key questions. The CushKins decided we could use the parts to illustrate our tale! 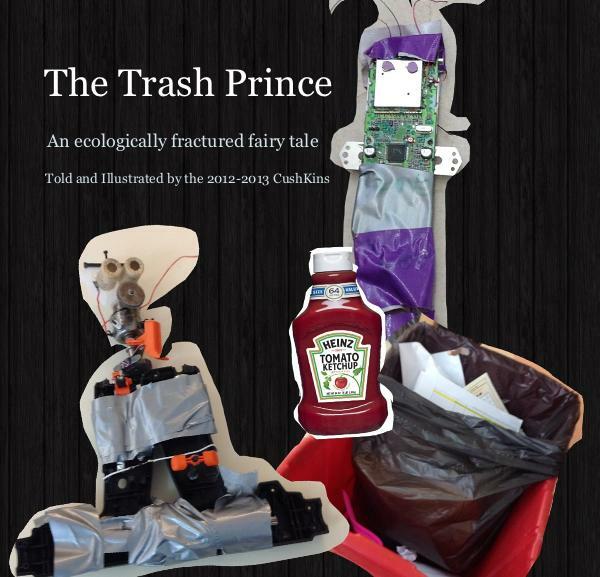 We'd also been working with Alan Magee on a project to support the town recycling committee and The CushKins decided that all three projects would fit together in one great story! ​You can read our book in it's entirety here. You can see our recycled sculptures used to illustrate our book along with recycled toys and other related projects that we put on display at our Arts in the Barn display. The anual CushKin Arts in the Barn exhibit has become a town tradition! We are lucky so many people in our fine town take an interest in and support what we do! What Did You Learn in School Today, revised and performed by Alan Magee, from an original song by Tom Paxton, used with the composer's permission.